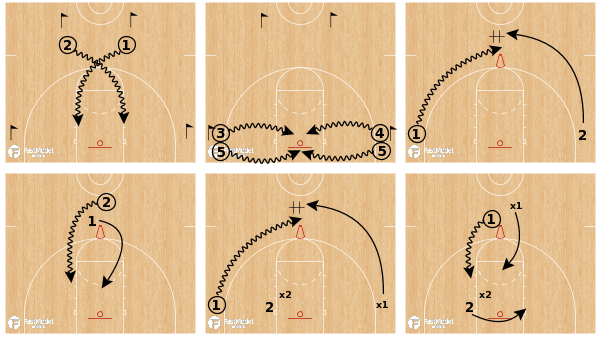 Teach players how to finish with both power and finesse in a variety of ways near the rim with these drills. Summer is a great opportunity to become a better player or coach. 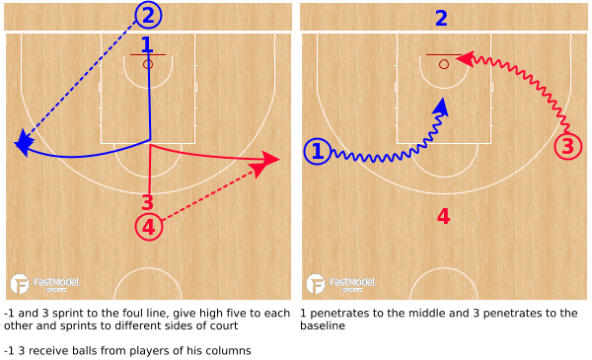 This post shares four drills to improve one of the most important skill for every basketball player – finishing. Many players and coaches focus on building various skills away from the basket, and they are necessary of course, but do not matter in the end if the player cannot finish the shot and score. 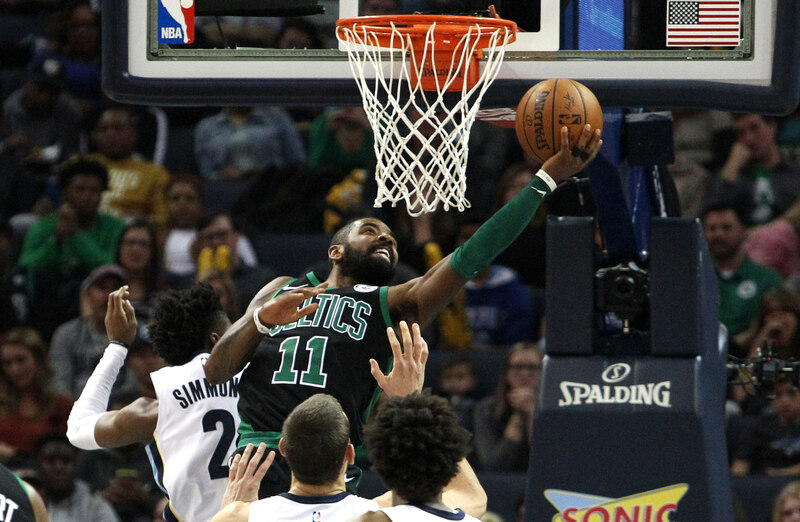 The best players make scoring at the rim easy. We run these game like finishing drills with our team as well as individual camps to develop confidence around the basket. Click on a diagram to download the drill to your FastDraw library. This is often the first drill of our individual player development work. It is a good for warming up, because after that drill players always hot and ready for tough work. Perform this drill on both sides, using right hand from right side and left hand from left side. 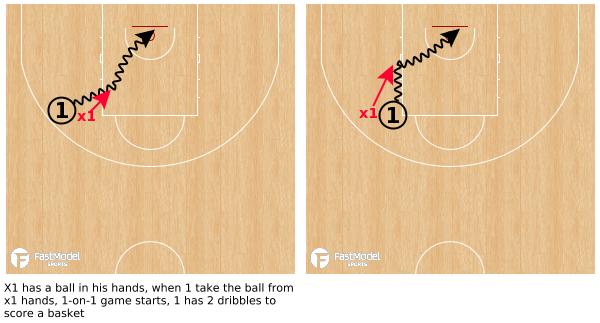 It’s key to make sure floaters are shot outside of the 3-second zone (paint) to simulate shooting over a defender that will be protecting the rim. Coaches may be familiar running this drill with true post players. However, I feel it’s a beneficial drill for every player on the court. As mentioned in the opening paragraph, it’s important for ALL players to be comfortable near the rim around traffic. 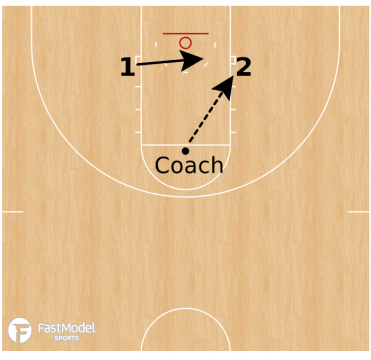 Run this drill with 3-6 players, each with balls except for one without. 5 sprints across lane to 3 and attempts to take the ball, while 3 holds the ball as strong as possible not letting go. 5 eventually takes the ball and finishes with a power dribble and layup/dunk from two feet under the basket (can alternate going baseline and middle, just make sure to work both in at some point). 5 rebounds own shot and goes to opposite line as 3 begins his/her rep. The key to this drill is the power dribble, which helps the player to transfer energy into their vertical jump. Pro tip: this drill can also be ran as a strength and conditioning exercise – simply swap out the basketball for medicine ball. This a good drill to teach players how to utilize different types of finishing. Here we rep taking the ball and penetrating after catching on the wing. We like to put coaches with pads under the basket to imitate contact from a defender. Work on a progression of different finishes: scoop layup, inside hand, power layup, jump stop, shot fake, up and under, pivot, etc. On the catch, it’s important to teach low stance, triple threat and a long and strong first step. These three things allow players to gain a huge advantage against the individual defender. This is a competitive 1-on-1 drill with a few rules and points of emphasis. The main idea is to teach players use their body to absorb contact from a defender, rather than avoid it, as they finish at the hoop. The most important point of this drill is that the ball handler has to initiate contact with defender before the defender contacts the ball handler. The second point is that the ball handler must force defender to trail on their back to create an open lane to the rim and ensure that any contact by defender will be a foul. The final point is that ball handler has only 2 dribbles max to score a basket. Make this a game to a certain score or for time, and be creative about switching positions so both players get chances to score and defend. Check out our #PlayerDevelopmentWeek Twitter Moment for tons of great content!